Fox News had a Newt Gingrich problem -- and on Tuesday it announced a solution. The cable news channel suspended its ties with Newt Gingrich, one of the people on Donald Trump's vice presidential short list. Gingrich has been a Fox News contributor since last October. He appears frequently on the channel to give political commentary. But he is increasingly a subject of news coverage as well. Trump is expected to name a running mate later this week, and Gingrich appears to be one of the front-runners, a person familiar with the deliberations told CNNPolitics. The source indicated that Trump will likely announce his pick on Friday. So Gingrich is off the Fox payroll. On Tuesday afternoon, a statement from the network said, "Fox News Channel has mutually agreed to suspend its contributor agreement with Former Speaker of the House Newt Gingrich effective immediately." "Due to the intense media speculation about Gingrich's potential selection as Donald Trump's vice presidential candidate, we felt it best to halt his contributor role on the network to avoid all conflicts of interest that may arise," executive vice president for news Jay Wallace said. Fox did not say when Gingrich might be back. Gingrich, a strong supporter of Trump, has been lobbying for the VP job. Last week the two men campaigned together in Ohio, where Gingrich received roars of approval and support from the crowd. 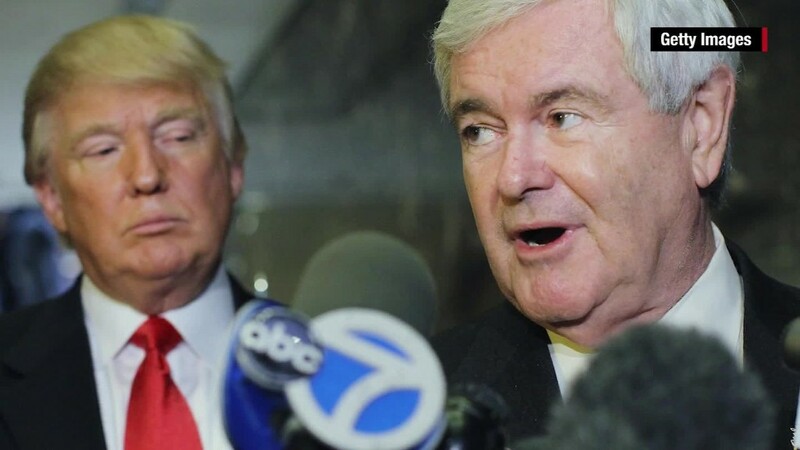 Trump essentially promised Gingrich a job during the rally, saying, "in one form or another, Newt Gingrich will be part of our government." That means if Gingrich is not Trump's running mate, he could be in line for a cabinet position -- further complicating his status as a TV talking head. A source with knowledge of Fox's internal deliberations said Gingrich is likely to remain off the Fox payroll whether he is added to Trump's ticket or not. Gingrich was interviewed on Fox's 4 p.m. program on Tuesday, a few minutes after the suspension was announced. He said "I don't know much" about Trump's decision-making, but predicted an announcement "no later than Friday." Gingrich mentioned two other prospects, Indiana governor Mike Pence and New Jersey governor Chris Christie, who are also "in the running." "It's a little bit like 'The Apprentice.' You find out sooner or later who is the last one standing," Gingrich said. The search has been going on for months. And some Fox hosts, notably the 10 p.m. host Sean Hannity, have promoted their colleague as the best choice for Trump. "I wouldn't be happy with anyone but Newt," Hannity said Monday night. Gingrich's role at Fox has received relatively little scrutiny until recently. But the conflicts have been obvious to some observers. "He's got a set of competing loyalties," Poynter Institute media ethicist Kelly McBride said in an interview with CNNMoney earlier Tuesday. "He has his loyalties to Fox and he has his loyalties to himself, to his ambitions to be veep. Those two things can't coexist." Gingrich's relationship was suspended with Fox once before -- back in 2011 -- when he was contemplating a run for president. After an unsuccessful bid, Gingrich joined CNN in 2013 as a co-host of "Crossfire." He was a CNN political commentator until joining Fox last year.